Big and small, he “took” them all. 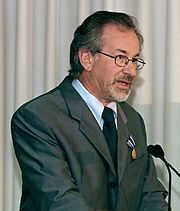 Bernard Madoff’s Ponzi scheme is another blow to America’s reputation, integrity…. The list of investors who say they were duped in one of Wall Street‘s biggest Ponzi schemes is growing, snaring some of the world’s biggest banking institutions and hedge funds, the super rich and the famous, pensioners and charities. 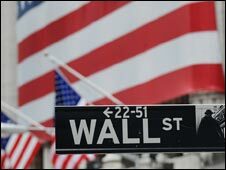 Among the world’s biggest banking institutions, Britain’s HSBC Holdings PLC, Royal Bank of Scotland Group PLC and Man Group PLC, Spain’s Grupo Santander SA, France‘s BNP Paribas and Japan’s Nomura Holdings all reported that they had fallen victim to Madoff’s alleged $50 billion Ponzi scheme. The 70-year-old Madoff (MAY-doff), well respected in the investment community after serving as chairman of the Nasdaq Stock Market, was arrested Thursday in what prosecutors say was a $50 billion scheme to defraud investors. Some investors claim they’ve been wiped out, while others are still likely to come forward. “There were a lot of very sophisticated people who were duped, and that happens a great deal when you’ve had somebody decide to be unscrupulous,” said Harvey Pitt, a former chairman of the Securities and Exchange Commission, a regulator in charge of monitoring investment funds like the one Madoff operated. Some of the world’s biggest banks have revealed that they are victims of a fraud which has lost $50bn (£33bn). 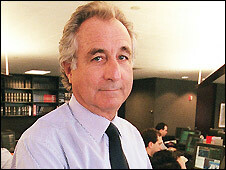 Bernard Madoff has been charged with fraud in what is being described as one of the biggest-ever such cases. Among the banks which have been affected are Britain’s RBS, Spain’s Santander and France’s BNP Paribas. One of the City’s best-known fund managers has criticised US financial regulators for failing to detect the alleged fraud. Nicola Horlick, boss of Bramdean investments, said US regulators had “fallen down on the job”. “This is the biggest financial scandal, probably in the history of the markets – $50bn is a huge amount of money,” she said. The terrorist attacks on Mumbai shocked the world, including the Muslim world. Questions are being asked about who was behind the attacks and the answers seem to be devolving to the group Lashkar-e-Taiba [there are many alternate transcriptions, but I’ll go with this one]. Groups, however, don’t function without funding, which raises its own questions. Many in the media and blogs see a Saudi hand in this. They note that Lashkar-e-Taiba operates on dual tracks: a militant wing and a charitable wing, Jamaat-ud-Dawa. The bifurcation of activist groups into militant and charitable wings is a tried and true one. Groups as various as the Irish Republican Army (IRA)/Sinn Fein and Hamas have found it a useful tactic to say while fund raising, “Oh, your contribution is only going to be used for good purposes!” And the donors have no easy way to find out just where the money has gone. The problem, of course, is that money is fungible. Money is collected. What goes to charitable uses is determined by the group. It can use the money as fits its needs, defined by itself. What money is spent on charitable acts—and this is done—is only a portion of that collected. Donations represent money to the group’s coffers that can be spent without draining the funds to support terrorist operations. While the Saudi government has made attempts to rein in contributions to foreign ‘charitable’ groups, there are many ways to avoid the controls. The easiest of them is to simply move cash around, hand-to-hand. There are Saudi regulations that limit the amount of cash that one can take out of the country, but those are not difficult to circumvent. Cash does not show up on X-ray scans, after all. Saudis are a soft touch when it comes to charitable giving. They take seriously the Islamic requirement to pay zakat, the 2.5% of one’s assets that should be paid to support the poor or spread the message of Islam. Wealthy Saudis, in particular, actually have trouble getting rid of that much money on an annual basis. They can be successfully approached with a good, tear-jerking story and they’ll come up with a donation. With no way to track just where that money goes, it’s far too easy for it to go astray.